One of the key questions we ask customers is “what is the application?” This question isn’t asked in order to steal your idea but to ensure that the plastic you’re looking for is optimal, or even workable in that application! Industrial plastics are excellent mechanical materials overall; however, like anything they do have both strengths and limitations. This article will review the core line of industrial plastics we carry, give the strengths, the limitations, and common applications/places where the plastic is wrongfully specified. Strengths: Well balanced properties, economical, and readily available. Specification errors: high load bushings, unrealistic tolerances, not compensating for thermal expansion. Strengths: High load bearing strength, diverse formulations, suits a wide variety of applications. Weaknesses: Absorbs water, poor impact and cold-temperature properties. 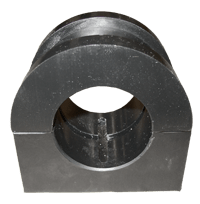 Specification errors: Impact parts, marine applications (without accounting for swell), using nylon bushings in high RPM applications. Strengths: High load bearing strength, replaces nylon in “wet” applications, machines to excellent tolerances. Weaknesses: Impact, temperature (especially steam) resistance. Specification errors: Using black (copolymer) acetal in food processing applications. It is not food-safe, unlike the blue and white. Strengths: Excellent impact, cold weather, bearing, and moisture-resistance properties. Weaknesses: High cost, elevated temperatures. Specification errors: Typically in applications that generate high internal heat, such as a hammer cushion for pile drivers. Tuffkast is also softer than nylon, which can lead to increased wear in certain applications. Strengths: Extremely high impact strength. Weaknesses: Very prone to scratching. Specification errors: As glass/sight part without upgrading to a anti-scratch version of the plastic. Strengths: Scratch resistant, economical, stronger than glass, fairly resistant to weathering. Weaknesses: Difficult to fabricate, prone to cracking. Specification errors: Using in “Do-it-yourself” projects without proper knowledge of fabrication procedures. Strengths: Impact resistance, rebound, good bearing strength (bearing grades only). Weaknesses: Water saturation degrades the plastic (especially softer grades), vibration degrades the plastic’s composition. Specification errors: Vibration or moisture applications. Strengths: Lots of choice between properties, cost, wide application variety. Weaknesses: Polyurethane is superior in many applications, grades must be selected carefully. Specification errors: Choosing an ineffective grade of rubber for an application to save on cost, assuming the lower grade will still function. For more information about which plastic is best for your application, please contact us. Creep: The slow changing in dimensional stability of a plastic. Especially relevant with polyethylene. Cross-linking: When valence bonds are formed between polymer chain molecules. In effect, making the material stronger. Commodity plastic: lower priced, lower performance plastics used for common consumer needs such as point of purchase displays, toys, household containers. 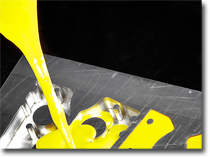 Engineering plastics: higher priced, higher performance plastics used to solve problems for industry. For example, bushings, bearings, wear guides, diverter arms, hopper liners, etc. FRP: Fiberglass reinforced plastic. Corrosion-resistant materials used as railings, grating, stairways, etc replacing traditional materials such as steel, aluminum or wood. Polyurethane: An elastomer with unique physical properties. Can be made anywhere from a soft deadplate to absorb impact, to hard lubrication-impregnated bearing grades. Thermoplastic: A plastic that can be softened by heat and hardened by cooling in a reversible process. Thermoset: A Plastic that cannot be reformed after setting. UHMW-PE: Ultra High Molecular Weight Polyethylene. Perhaps the most popular and widely used engineering plastic. At times in the plastic industry it seems like certain engineering plastics such as UHMW-PE and PTFE get all the attention as far as properties and applications. While those polymers certainly are worthy of attention, other plastics have outstanding characteristics, which should not be overlooked. Redco™ Polyurethane is one of the most versatile and remarkable plastics available and can be used in a wide array of applications that perhaps no other material can compete with. The following is a primer on the unique characteristics, grades and possible applications for Redco™ polyurethane. Versatility: Redco™ Polyurethane comes in a wide range of hardness’s – from bouncy ball soft to bowling ball hard. 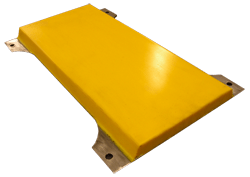 This opens up a breadth of potential application – from shock pads and deadplate on the “soft” end, to heavy-duty bearings on the “hard” end that will outwear traditional brass and bronze. Memory: Perhaps the most unique properties of Redco™ polyurethane is its memory. It can absorb impact and dent, only to rebound and regain its original shape. Other plastics do not have this ability. 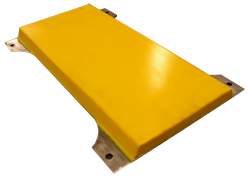 This makes urethane the ideal material for shock absorption and deadplating. What is the “A” and “D” scale? Urethanes are classified to a hardness scale called the “Durometer” rating. This is an often confusing scale to those unaware of polyurethane classification. For example, Redco™ produces polyurethanes in grades of 70A and 75D – don’t be fooled – those are vastly different materials. A classification of “A” denotes a soft urethane (on same scale as rubber) and a Redco™ 70A polyurethane would be commonly used as shock pads. A Redco™ 75D polyurethane ,on the other hand, is bearing-grade material with high impact strength designed to replace metals in applications. “D” refers to the plastic scale, which in this case denotes a hard urethane. To illustrate the wide variety of Redco™ polyurethane available we’ve provided a few examples below. Redco™ Deadplate was designed for maximum energy absorption. It is commonly used in sawmills as a bumper for incoming logs that impact a part of the machinery. Deadplate has a rating of 52A and would feel like a “tough” rubber pad to your touch. Redco™ 430 is an abrasion resistant material with outstanding impingement resistance. As a mid-grade material in the range of urethanes, it can be classified by hardness ratings of 90A or 43D. 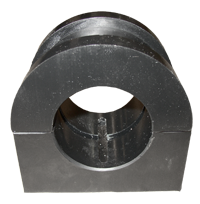 This grade has a variety of uses from shock pads to seals, couplings, valve gates and wear slides among many others. Redco™ 750 SXL is used in sliding, low temperature, and gritty environments. It is an excellent bearing material and has great self-lubricating properties. Its durometer rating is 75D and is used in bushings, bearings, diffusers and retainers. Redco™ urethanes are an excellent material for an impressive breadth of applications. If you have questions regarding your application please contact us today.